Last week, I took some photos that powerfully demonstrate the importance of plant diversity. 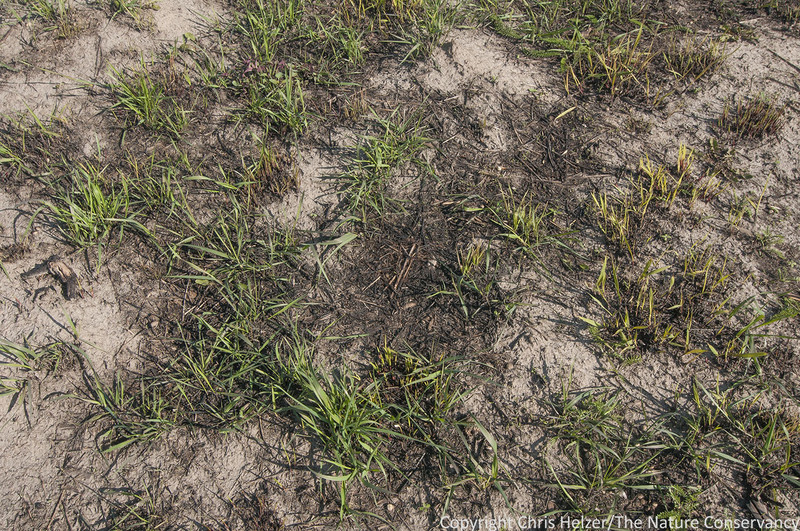 Research plots at The Nature Conservancy’s Platte River Prairies. Several years ago, we created some research plots to help us learn more about how plant diversity interacts with ecosystem function. As you can see above, the plots include a grid of squares (3/4 acre in size), each planted with one of three seed mixtures: monoculture (big bluestem), low diversity (grasses and a few forbs harvested in the fall), and high diversity (100 species). Working with academic partners, we have several research projects underway, including a couple that demonstrate the influence plant diversity has on the spread of invasive plant species. 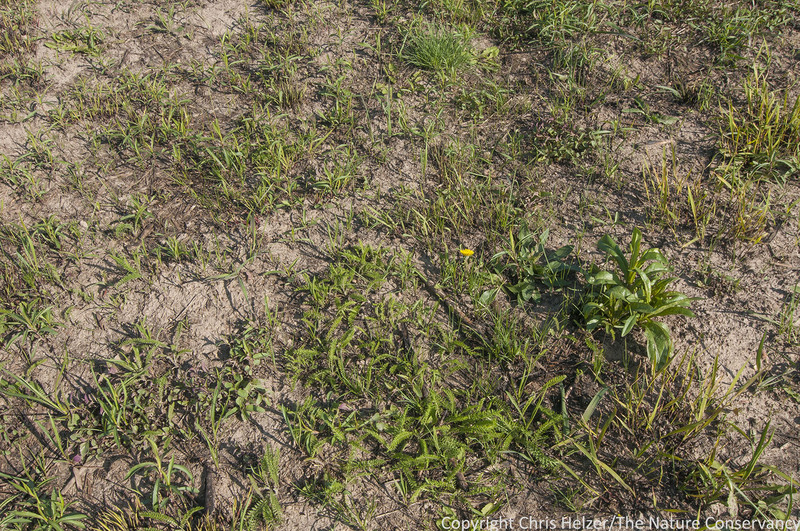 Other researchers have found similar relationships between plant diversity and resistance to invasive species, but that is only one of many benefits from having a wide variety of plants in a prairie. Both herbivores and pollinators benefit from having a broad selection of food choices available to them. 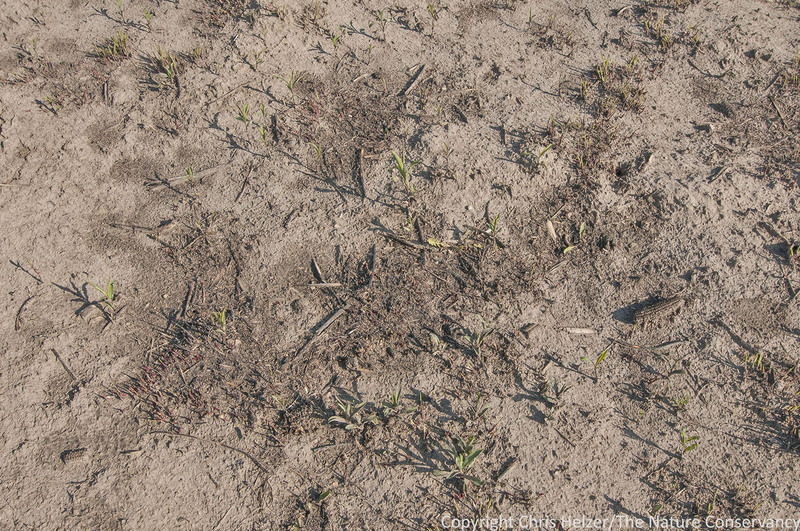 During extreme weather conditions (hot, dry, wet, cold), high diversity prairies always have plants that flourish under those conditions and help provide habitat and food conditions for animals. Most importantly, because of these and other reasons, prairies with high plant diversity also have high total biological diversity, including more species of microbes, insects, other invertebrates and vertebrates. That overall diversity is important for its own sake, but also because of the role each species plays in the functioning of the ecosystem. The aerial photo I took from our small drone last week illustrates another benefit of plant diversity; prairies with high plant diversity have green vegetation for more of the growing season. Every plant species starts and ends their growth period at different times. Some start early, bloom, and are done before summer even starts. Others bide their time and don’t bloom until late in the fall. When you mix all those species together in one prairie, you end up with consistent, but ever-changing, availability of nutritious vegetation and flowers throughout the growing season. Labeled plots, showing the location of the various treatments. Our monoculture research plots (big bluestem only) looked very different from our other plots last week because big bluestem was just starting to grow (on April 23). Even after we burned all the plots this spring, allowing the soil to warm earlier than it otherwise would have, the most advanced big bluestem plants only had leaves of a few inches in length. Our low diversity plots (mostly grasses) showed more green, but only due to the presence of one grass species, Canada wildrye (Elymus canadensis), a cool-season grass that begins its grown early in the year. By contrast, the high-diversity plots had many plant species growing, with some close to blooming. 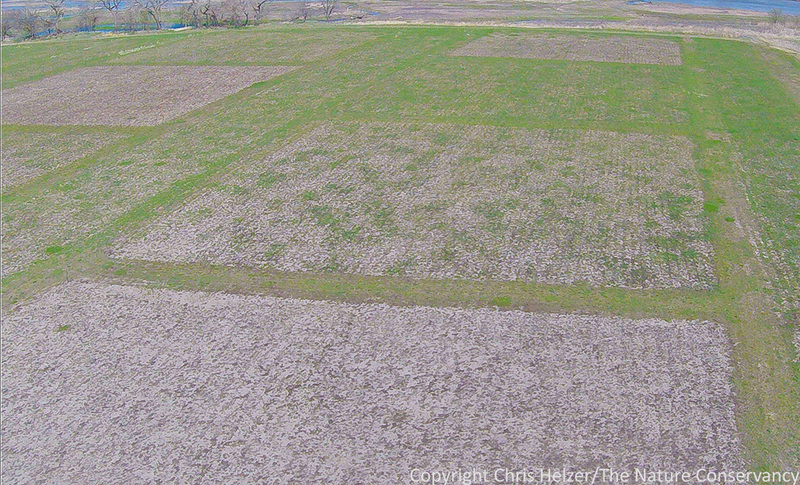 The monoculture plots were planted only with big bluestem, which was just barely starting to grow last week. The low diversity plots were slightly greener than the monoculture plots, mainly because Canada wildrye was growing quickly (most of the other grasses were just breaking dormancy). The high diversity plots had numerous species showing vigorous growth, even early in the season. Although the visual differences between plots on April 23 are striking, they are ecologically significant as well. 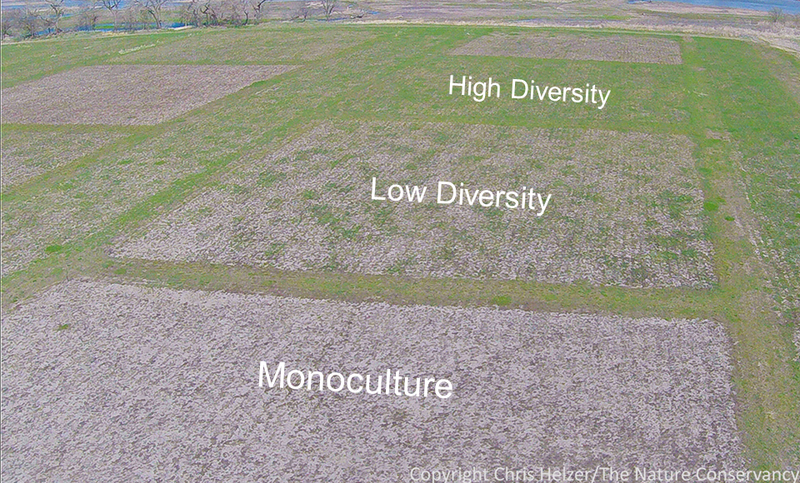 Invertebrate and vertebrate herbivores (including cattle, if the plots were grazed) can find a variety of forage options in the high diversity plots right now – far more than in the low diversity or monoculture plots. Within a week or so, the high diversity plots will also have several different kinds of wildflowers in bloom, providing resources for early-season bees and other pollinators. The low diversity and monoculture plots will have far fewer resources for pollinators throughout the season. Furthermore, invasive plants species trying to establish themselves within the high diversity plots face stiff competition from plants using wide range of growth strategies. They will find a smaller amount of resistance in the other plots, where less diverse plant communities are not as efficient at taking up space and fully utilizing resources. Plant diversity is incredibly important in natural systems for a variety of reasons, only a few of which are mentioned here. We still have a lot to learn about how plant communities function, and how plant diversity plays into that. However, we already know enough to recognize the value of having numerous players in the game. It was fun to see a visual demonstration of that value last week.